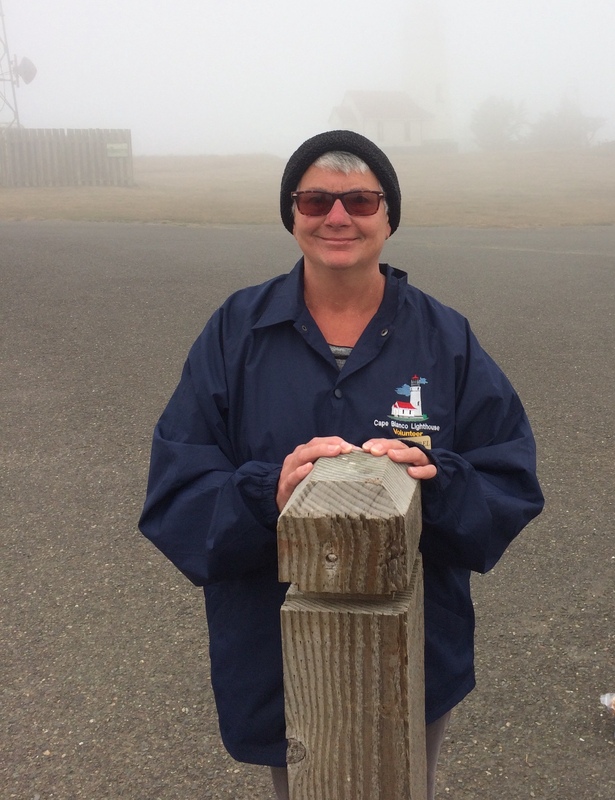 While I was busy pursuing volunteer venues in Port Orford, Jeff made his own phone call, answering an ad on the local radio station for a cashier at the Cape Blanco Lighthouse. 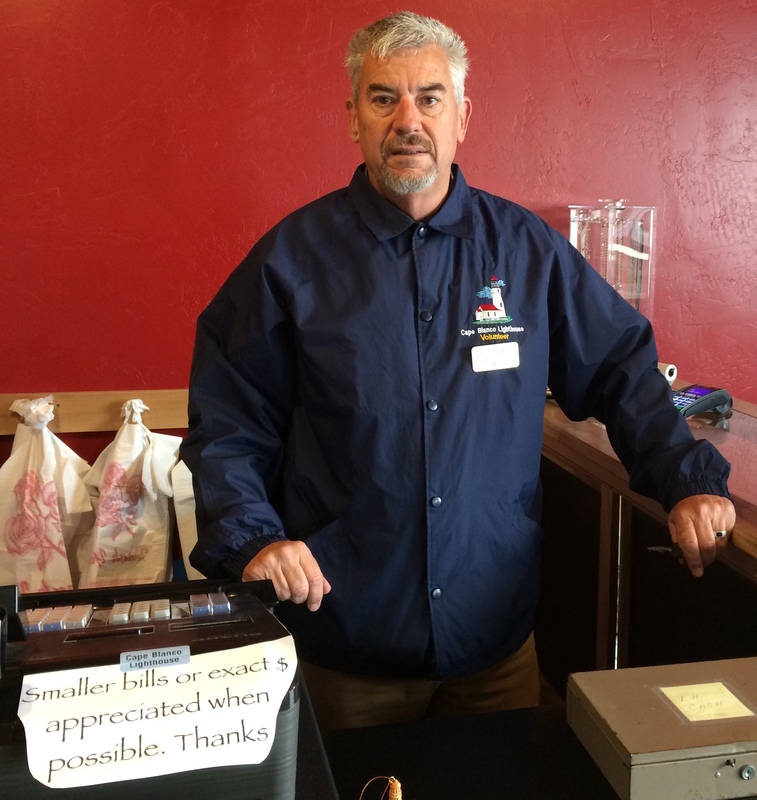 On Thursday, May 24th, Jeff met Steve Roemen, Executive Director of the Cape Blanco Heritage Society and began volunteering once a week at the Lighthouse Visitor/Gift Center. 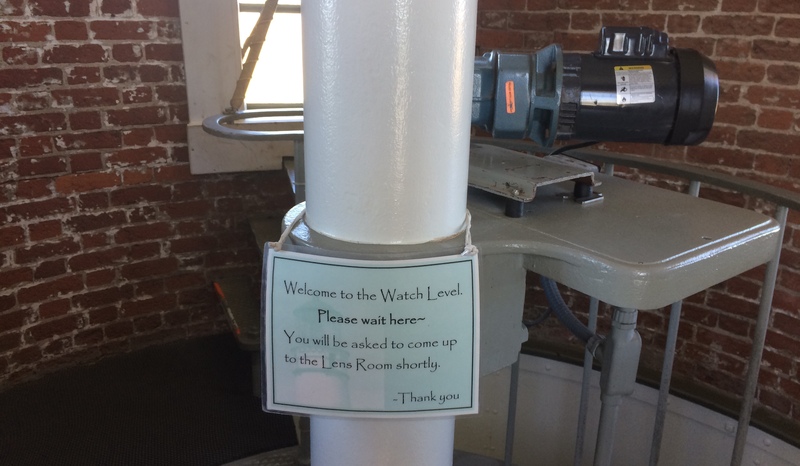 Jeff soon learned that Steve was looking for a docent in the lantern room of the lighthouse on Mondays to relieve him. 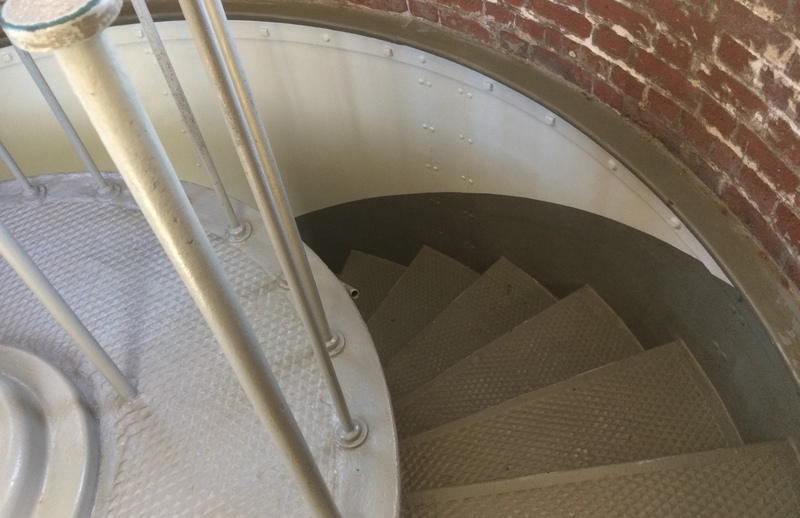 On June 4th I shadowed Steve and a few hours later I was taking 5 people at a time up to the lantern room to share information about the fresnel lens and the nighttime duties of the lighthouse keepers. 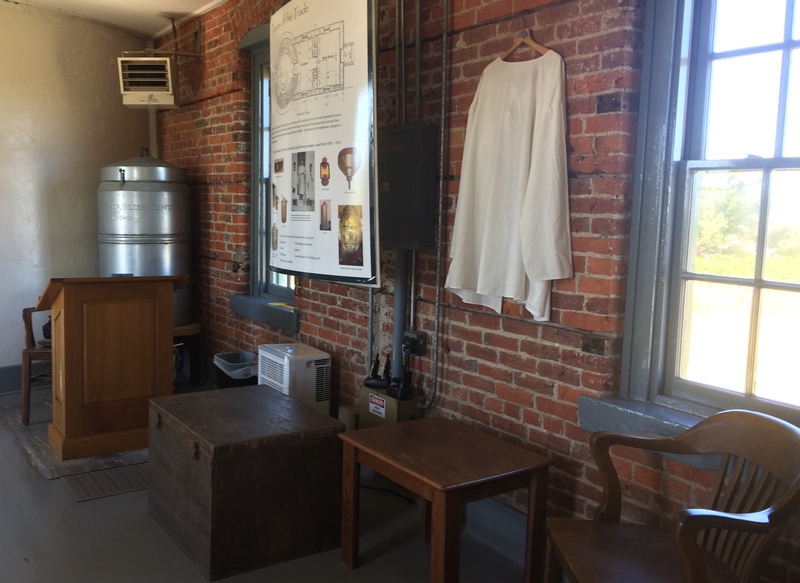 The tour starts downstairs in the office/workroom and oil room. 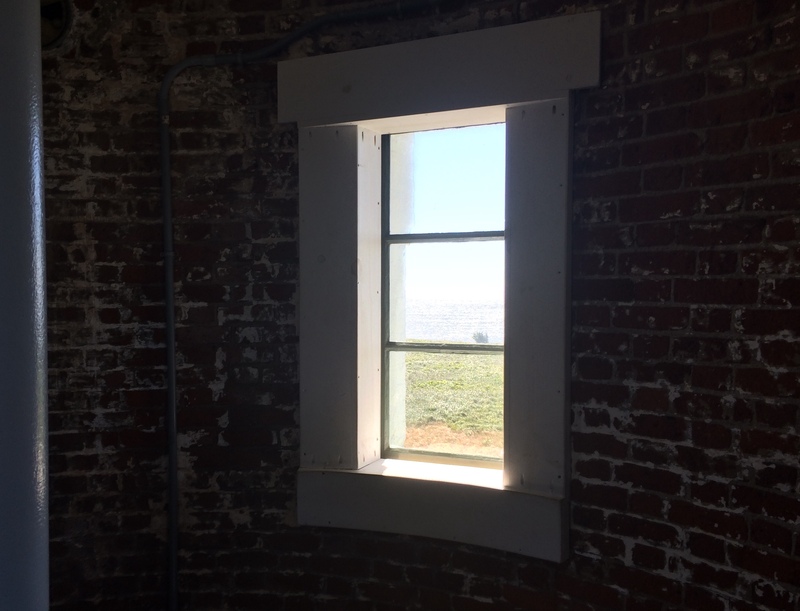 A seam in the ceiling indicates the room was once divided by a wall separating the 2 areas. 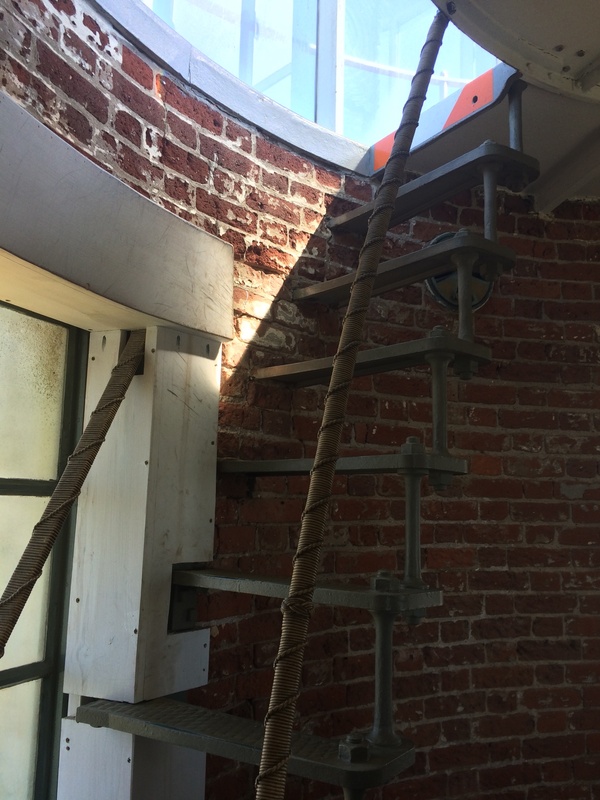 The lighthouse keepers began their days fulfilling office duties and completing any repairs on lighthouse equipment. 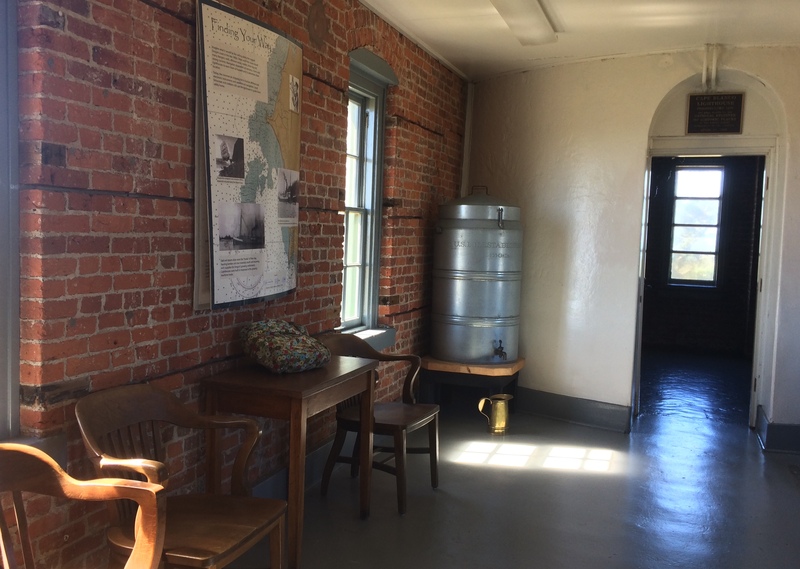 Eight 100 gallon drums, originally filled with lard and later mineral oil, were heated by a potbelly stove. 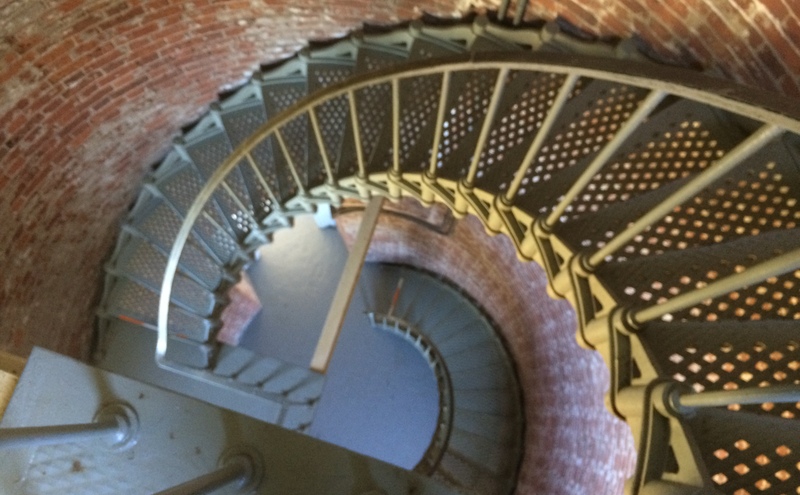 Before sunset, the 2 keepers on night duty carried pitchers of oil, a supply of wicks, and lantern replacement parts up the 59 spiral steps to the Watch Level. 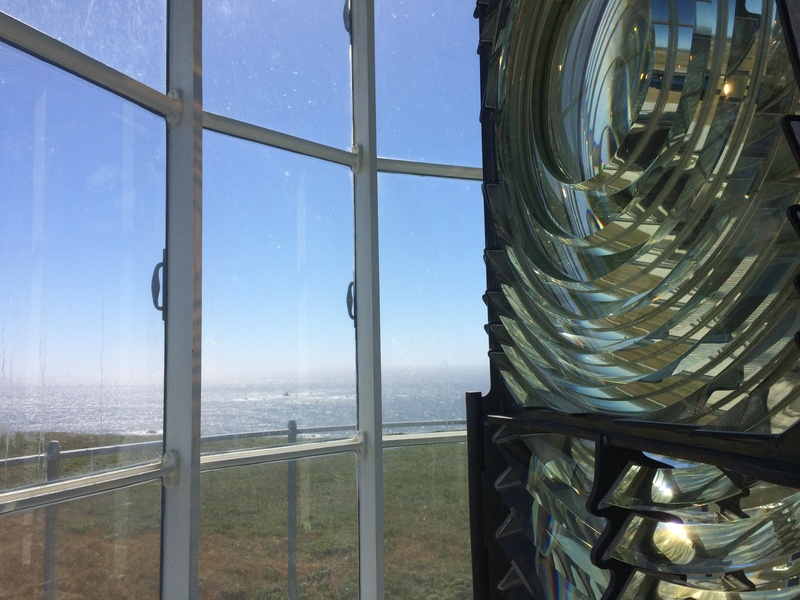 Right before sundown they ascended the ladder into the lantern room, opened the fresnel lens, and lit the fire that would guide ships around Cape Blanco at night. It’s possible its light could be seen 23 miles out at sea on a clear night. 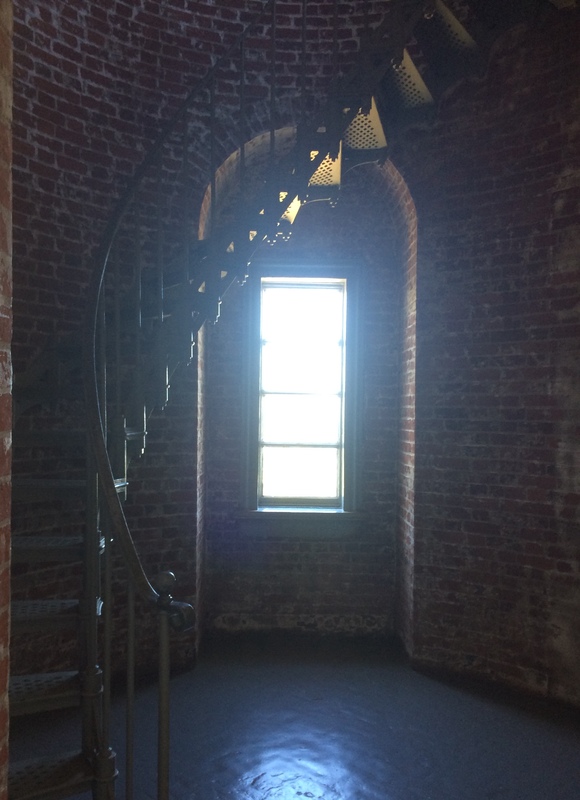 After lighting the wick, they descended onto the Watch Level again to adjust the series of flues along the upper brick walls to ensure the fire was burning bright and steady. Please remember to stay on the black mat, to refrain from touching the lens, and to ascend and descend the ladder facing its steps. 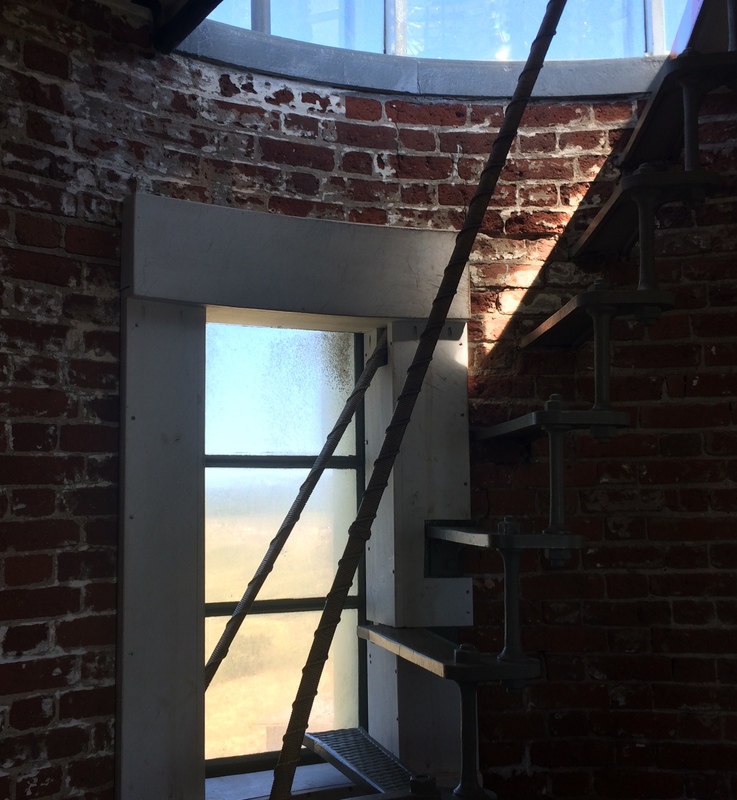 As people step up into the lantern room the oohs and aahs and wows begin as they get up close and personal to the rotating fresnel lens installed in 1936 and still functioning today in 2018. 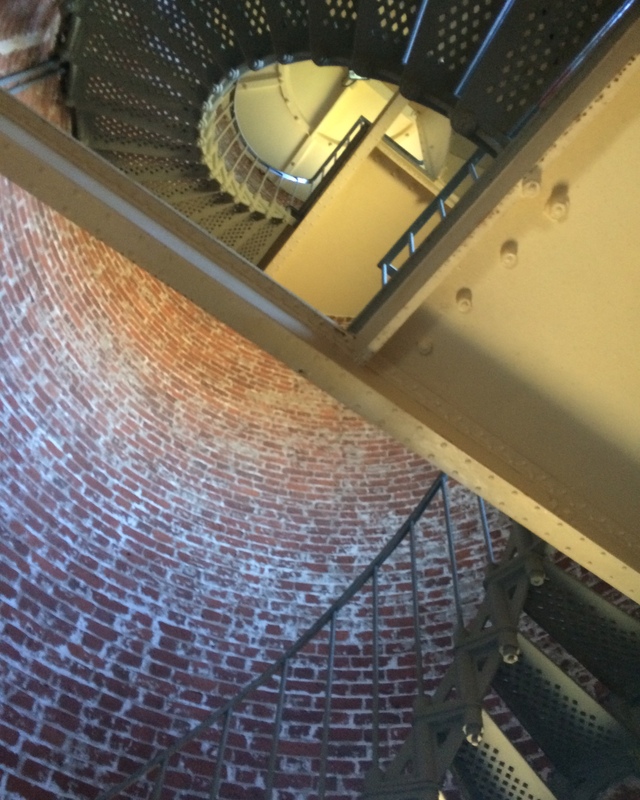 This lens is not the original one of the lighthouse. 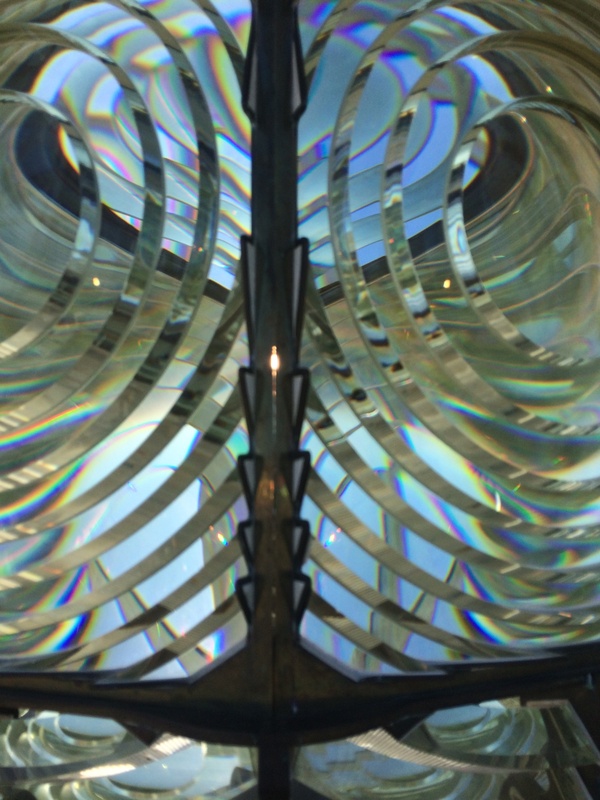 The first fresnel lens was a little bigger, did not rotate, and the focal plane was a drum panel. Both lenses, however, were designed by Henry Lepaute and manufactured in Paris, France. The lens you are viewing weighs one ton. Eight bullseyes rotate slowly around a 1,000 watt halogen bulb. The second bulb is the backup. On a clear night or day the light can be seen as far as 26 miles away. 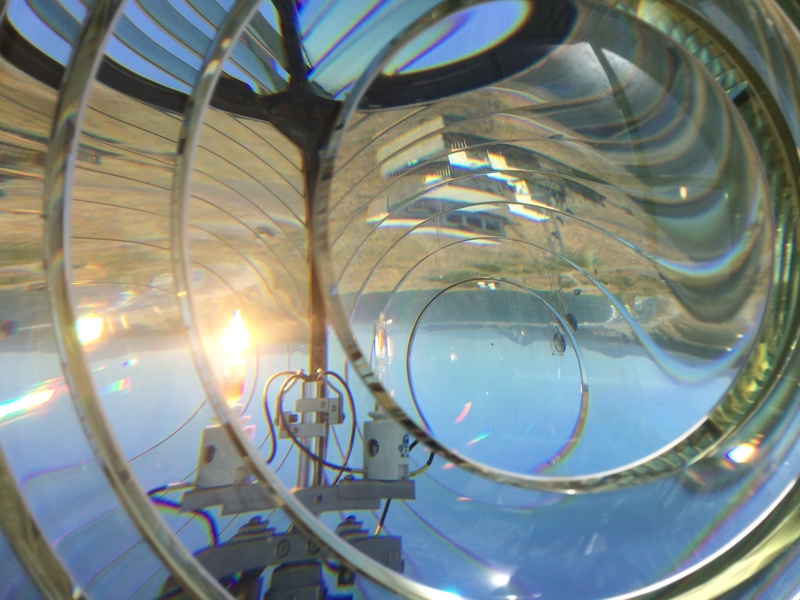 That’s the magic of the optical physics of the fresnel lens. Prisms bend the waves of light and concentrate them into a focal plane. Every 18.2 seconds the focal plane of light emanating from a bullseye appears for 1.8 seconds. 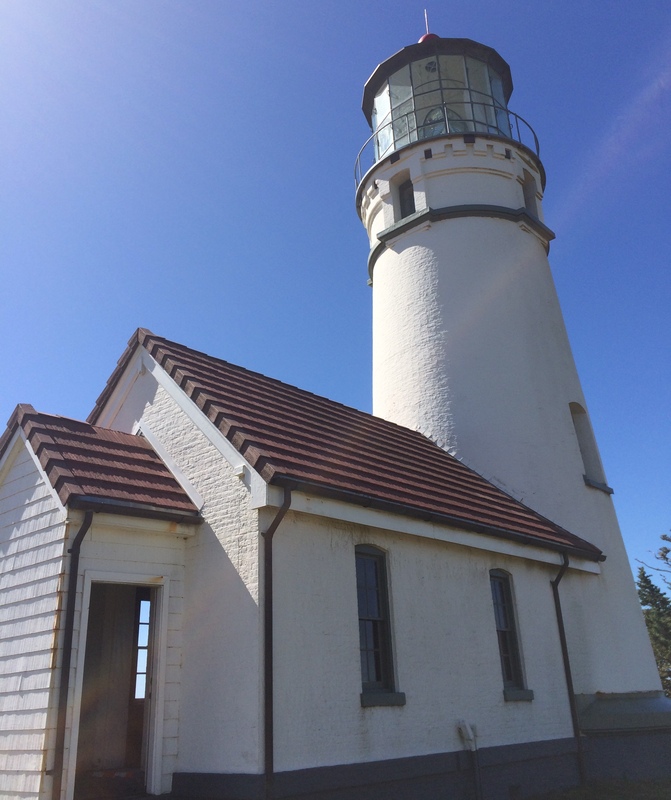 There’s much more I could share with you but I hope you will someday visit Cape Blanco Lighthouse. 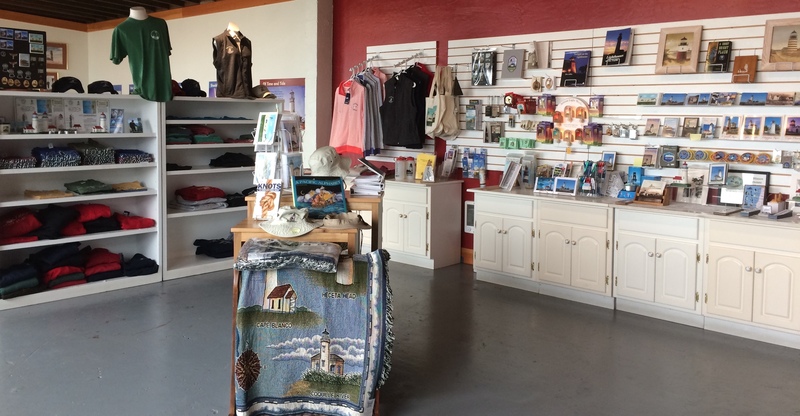 The lighthouse is open from 10 am-3:15 pm Wednesday through Monday April through September. If you visit on a Monday my friends from the Heritage Society, Steven, Bob, Judi or Steve, might be giving tours. 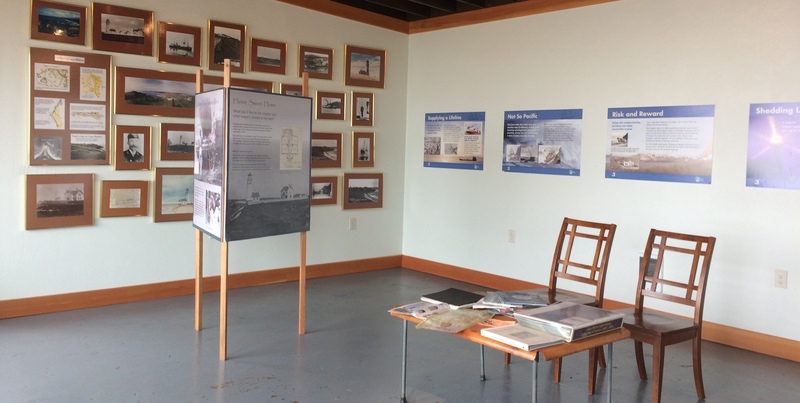 The State Park’s volunteers are docents Wednesday through Sunday. As we descend back down into the office/work/oil room let me say a few words about the weather here. 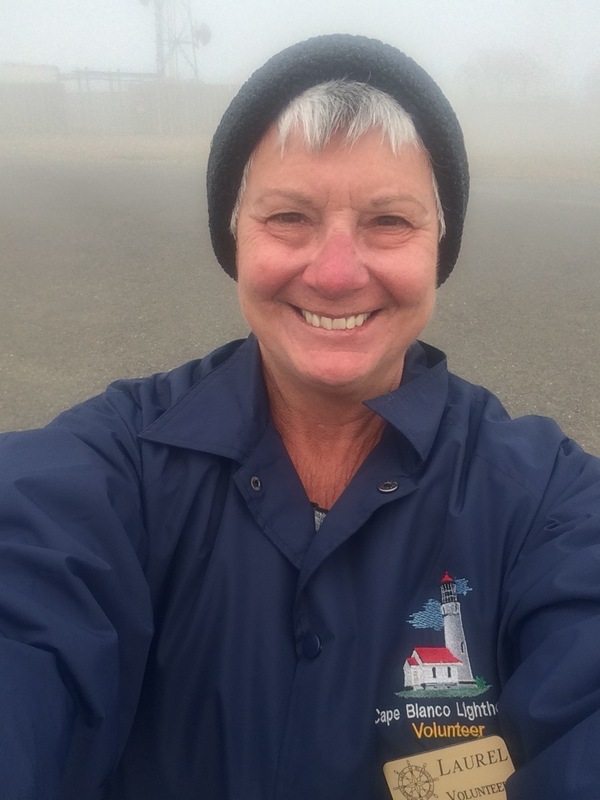 Sometimes thick fog shrouds the cape and beaches. 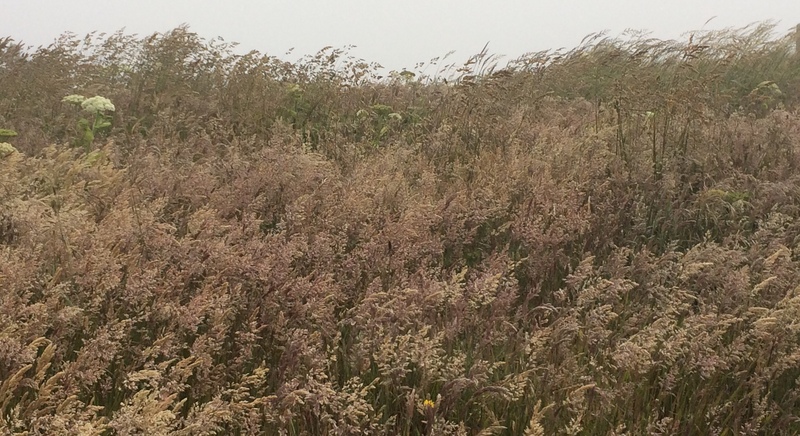 Sometimes the winds almost knock you over. Sometimes it’s so cold and windy that you need to don hat and gloves. My friend Daisy sent me this link from August 25th of The Oregonian, the oldest continuously published newspaper on the U.S. west coast. (There’s that word continuously again!) 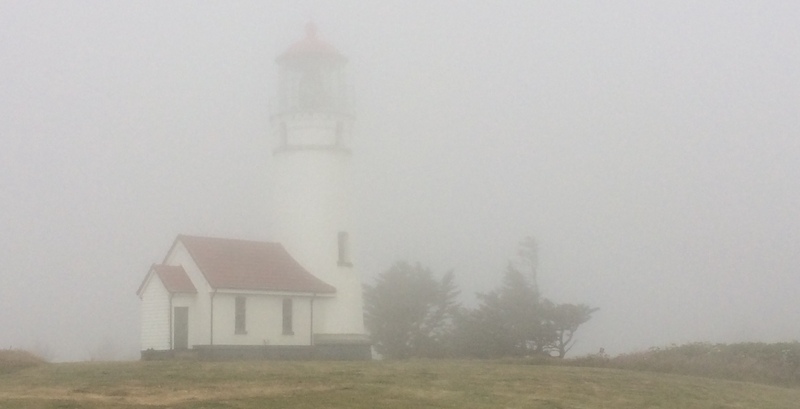 Blogger Steven Michael shares his 2014 visit to Cape Blanco and Port Orford. It’s a well written article with great pics. I hope you will take the time to read it!